City Faces, 1995, Ink & Color on Shaun Paper, 26.75" x 26.75"
Christmas Snow, 1989, Ink & Color on Shaun Paper, 25.5" x 26.25"
1:00 – 4:00 PM, RSVP before Feb 3, Wed.
ZHENG Lianjie is a self-taught artist, having practiced Chinese calligraphy, poetry, and traditional ink on paper painting from a very young age. Born in 1962, he was just four years old when the Cultural Revolution (1966-1976) began. Like all Chinese who grew up during that period, ZHENG did not get a regular education, as schools were shut down. 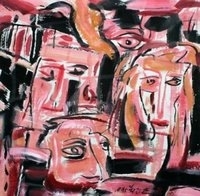 After the Cultural Revolution, he worked in a state-owned factory but soon quit to devote himself to modern ink painting. ZHENG first gained international attention in 1993 for his “Binding the Lost Soul: Huge Explosion.” He and a group of performers—students, villagers, and other artists—salvaged bricks from a crumbling portion of the Great Wall and tied red ribbons around them. The process and the resultant hill of beribboned bricks were both a celebration of the Great Wall and an elegiac lament for it. 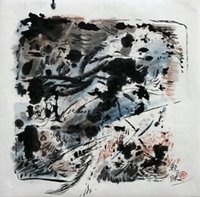 ZHENG is influential in the movement of Chinese contemporary ink painting. He has given lectures and participated in panel discussions at college campuses, including Harvard, Columbia, and Swarthmore.